Hindsight is 20/20, and if Nedals Promotions could have done Saturday Night’s Main Event again, they might have placed the opening bout as the main event, and the main event as the opening bout. Prior to event headliner, the main event featuring undefeated prospect Derrick Webster. Undercard headliner Juan Rodriguez was pulled from the card, leaving the crowd with only being able to watch six fights, with a far past his prime Jameel McCline as the main event. The night started off with a bang, as opening bout in the junior welterweight was between Tyrone Luckey (4-1) and Ramon Ellis (2-7-1). Records can be deceiving, and boxer with a poor record who has fought decent to good competition might be better than first perceived. Ellis fought his heart out, and the opening bout featured vicious exchanges and little, if any, breaks in the action. In the end, the right result was announced, as they fought to a majority draw, with scores of 39-37, 38-38, and 38-38. The lone score not deemed a draw was scored in favor of Luckey. The next bout featured Ivan Calderon’s younger brother Jose Calderon (3-1) as he took on Jason Sia (0-4) in another junior welterweight bout. Records were not deceiving this time, as Jose smashed Sia with a left hook to his temple, and Sia dropped like a bag of potatoes, giving Calderon the KO victory in the first round. Calderon looks small for the junior welterweight division, but his punch carries a lot of weight. Official time of the stoppage is 2:49 of round 1. Alando Swain (4-1) took on Eddie Edmonds (2-1-2) in a middleweight bout that was next on the card. Swain, trained out of Mugsy’s gym, was able to control his opponent with stiff jabs and effective body work. No suspense in this one: Swain won easily with scores of 40-36, 40-36, and 39-37. Edmonds seemed more interested in grabbing and holding than in actually fighting. The headlining bout on the undercard was a woman’s match between Nydia Feliciano (4-2-3) and debuting Mikayla Nebal (0-0). Nebal was clearly a debuting boxer, but she showed tremendous heart and she had passionate supporters. She was unable to stop the effective 1-2 combinations of Feliciano. 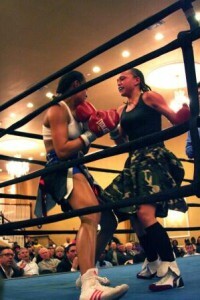 The fourth round featured a lot of actions, with Nebal coming out aggressive, knowing she needed the KO to win. Too little too late: all three judges found it 40-36 for Feliciano despite some ring side observers feeling Nebal should have at least been given the final round. The co-main event was a bout between undefeated Polish boxer Pryzemyslaw Opalach (9-0) against Eberto Medina (5-7-1) in a middleweight tilt. At first glance, Opalach seemed to a fighter worth watching, as he had a decent record and a good following in Hamilton Manor. However, when you realized his victories came against opponents with records of 10-40-2, 1-19, 0-8, 1-5, 0-6, and 0-14, with all of his fights taking place in Europe, and you saw Medina pacing in his corner with the look of fire in his eyes, you could smell a possible upset brewing. Medina came out aggressive, stayed behind his jab, and chased Opalach around the ring. The last two rounds were relentless, as half the crowd was cheering for Medina and the Polish supporters were cheering on Opalach. Medina clearly threw more punches and landed the more effective punches. Opalach suffered his first defeat when the official scores were read: 60-54, 59-55, 60-54. 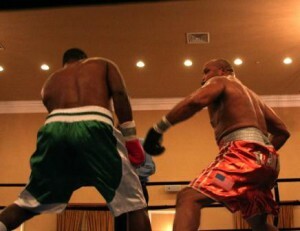 The main event featured former Heavyweight title challenger Jameel McCline against journeyman Livin Castillo. The heavyweight division is not dead, but this bout put most of the audience to sleep. McCline won a lackluster decision and never pressed the action to go for the knockout. McCline won a split decision 76-75, 77-74, and 74-77.